摘要 目的探讨保山市2005-2014年流行性乙型脑炎发病的时间分布特征。方法应用集中度和圆形分布法对保山市2005-2014年流行性乙型脑炎疫情资料进行处理、分析。结果 2005-2014年保山市流行性乙型脑炎发病时间分布的集中度M=0.818,圆形分布r=0.820,平均角ā=203.87°,Z=205.08,P〈0.0001,发病高峰日为第238日,流行高峰期是200~274日。结论保山市2005-2014年流行性乙型脑炎发病有很强的季节性,集中度和圆形分布指标可以较为准确地反映保山市乙型脑炎的流行高峰及流行时间。 Objective To understand the time distribution of Japanese encephalitis in Baoshan from 2005 to 2014. Methods Concentration degree and circular distribution methods were used to analyze the time distribution of Japanese encephalitis in Baoshan during this period. Results The concentration degree（ M） was 0. 818,the circular distribution（ r） was 0. 820 for Japanese encephalitis in Baoshan during this period（ average angle = 203. 87°,Z = 205. 08,P 0. 0001）. The incidence peaks was on 238 thday,the epidemic was during 200thday- 274 thday. 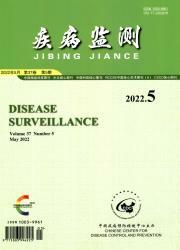 Conclusion The seasonality of Japanese encephalitis was obvious in Baoshan from 2005 to 2014. The concentration degree and circular distribution indexes reflected the time distribution for Japanese Encephalitis in Baoshan accurately.